In 2013, Xulio Lorenzo emerged in the Galician music scene as a consequence of the widespread media coverage of his muiñera, traditional dance and musical genre of Galicia, dedicated to his home town in the music festival called BailaMos. The recording of the muiñeira is followed by Danza de Alfacuca, composed by Xulio Lorenzo as well, and dedicated with great affection to his friend and bagpipe player Juan “O Chapela”. Bonequiña, a melody filled with loving and caring notes and sounds. It is a song with local aromas and nuances, that could be performed as a Galician pandeirada, a tambourine tune, dedicated to his daughter. Here, Xulio goes back to his childhood looking for his first musical references, pandeiradas, muiñeiras, foliadas…all skillfully combined with today’s music scene. If we asked Xulio, he would plainly tell us that all cantos, songs and tunes arise from there, from the Ialma, from the soul. This particular song is about what we have inside, our heart, our soul…feelings expressed by melodies. Special thanks to Arume de Guizán for the lyrics. In 2015, Xulio was invited by a Neapolitan folk band called Brigan to go on a tour in the south of Italy. It was an incredible week, full of concerts, recordings, anecdotes and wonderful landscape. As a result, Xulio composed Brigan Vals, a song that was created to symbolize a gift of friendship in which Franccesco Di Cristofaro, manager of the Brigan band, could collaborate in the distance. Special collaboration: Franccesco Di Cristofaro. This song was first performed in O Muíño Vello of Delio, in Reboreda, a musical sanctuary located in the Rías Baixas, a series of four estuarine inlets located on the south west coast of Galicia. It was the big audience of that magical evening who gave this song its title. Suggestions made reference to the sea and love, hence its name. 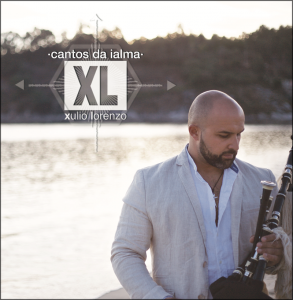 Having the opportunity to collaborate with one of the most outstanding current bagpipers of Galicia, was one of the best experiences that Xulio might have ever imagined. The great Marcos Campos joined Xulio to create a mix of Irish and Galician sounds and harmonics thus making us travel back through time and remind the origins of Celtic rituals. Saudades has the capacity to draw Xulio backwards to many past moments. Saudade is word that was defined by Manoel de Melo (Portuguese writer, 1660) as “ben que se padece e mal do que se gosta”, a feeling that is such a part of our tradition that makes us feel good in a our deepest sorrow and vice versa. It is dedicated to every person that was once part of his life and are no longer with us. Miña nai, miña naiciña (my mother, my beloved mother), one of the most emotional ballads from O Cancioneiro Popular Galego, Galician traditional repertoire. This version is dedicated with all love and affection to my mother, my beloved mother…Julia. This is both the most international and most curious song of the disc since it was composed at the airports of two continents and three different countries when returning from the Brazilian tour. Inspiration might sometimes happen in the most…unexpected places. As it is common knowledge, the greatest muiñeiras look their best with good and professional dancers. So, as far as Xulio is concerned, Chisco de Preiras, a professional artist and lover of Galician traditional dance, is the most outstanding dancer without a doubt. With this background, this lively and fun muiñeira dedicated to his dear friend, Chisco de Preiras, could not be missed from the repertoire. Alborada Camiño da Rosa, released by more than eighty bagpipers on 27th June 2014, arises from the mixture of two distinguishing traits of the district of Mos in the province of Pontevedra. In the first place, O camiño de Santiago that runs through this place, and secondly, the Rose festival, celebrated on 13th June, and whose emblematic rose, the Rose from Quirós, is found in the emblem of the Marquises of Mos. Xarabal, a bagpiper band from Vigo, of which Xulio was once a member in 1998, participated in this recording. San Simón, island of memories, considered one the most feared prison of the Spanish Civil War, is the source of inspiration of this song whose lyrics were written by the poetess Lara Boubeta Bamio, native of the land of O Morrazo, a county in the Galician province of Pontevedra, and whose talent could easily stem from Joâo de Cangas, a well known Galician medieval troubadour. Xulio puts the voice and Pedro Fariñas whith the G Pipe and the master of piano Alberto Vilas accompany the melody. Special collaborations: Pedro Fariñas and Alberto Vilas.